Biological drug and vaccine manufacturing has quickly become one of the highest-value fields of bioprocess engineering, and many bioprocess engineers are now finding job opportunities that have traditionally gone to chemical engineers. Fundamentals of Modern Bioprocessing addresses this growing demand. 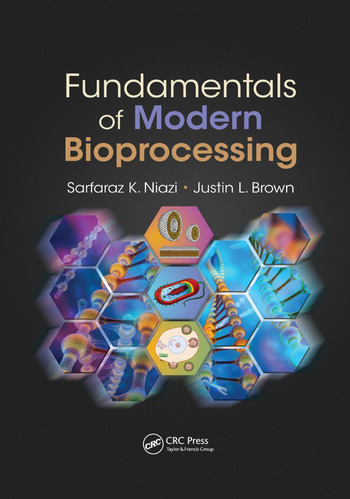 Written by experts well-established in the field, this book connects the principles and applications of bioprocessing engineering to healthcare product manufacturing and expands on areas of opportunity for qualified bioprocess engineers and students. The book is divided into two sections: the first half centers on the engineering fundamentals of bioprocessing; while the second half serves as a handbook offering advice and practical applications. Focused on the fundamental principles at the core of this discipline, this work outlines every facet of design, component selection, and regulatory concerns. It discusses the purpose of bioprocessing (to produce products suitable for human use), describes the manufacturing technologies related to bioprocessing, and explores the rapid expansion of bioprocess engineering applications relevant to health care product manufacturing. It also considers the future of bioprocessing—the use of disposable components (which is the fastest growing area in the field of bioprocessing) to replace traditional stainless steel. Fundamentals of Modern Bioprocessing outlines both the principles and applications of bioprocessing engineering related to healthcare product manufacturing. It lays out the basic concepts, definitions, methods and applications of bioprocessing. A single volume comprehensive reference developed to meet the needs of students with a bioprocessing background; it can also be used as a source for professionals in the field. Sarfaraz K. Niazi, Ph.D., is the founding executive chairman of Therapeutic Proteins International, LLC. He began his career teaching pharmacy at the University of Illinois, where he was a tenured professor, before entering the pharmaceutical industry with Abbott International, where he became a Volwiler fellow. Dr. Niazi is a licensed practitioner of patent law, has published numerous books and papers, and has been recognized with several awards for his contributions to science and literature. His inventions, philanthropy, and passion for science, literature, music, and photography have also been documented in publications such as Forbes, Chicago Tribune, and Crain’s Chicago Business. Justin L. Brown, Ph.D., joined the biomedical engineering faculty of The Pennsylvania State University in 2010. Prior to joining Penn State, Dr. Brown spent seven years at the University of Virginia where he obtained his Ph.D. in biomedical engineering and completed a postdoctoral fellowship in cell and microbiology. His current research interests focus on exploring the signaling cascades and lineage commitment of mesenchymal stem cells in response to biomaterial surfaces that have potential for translation to clinical strategies. Dr. Brown’s lab applies both a reductionist and high-throughput systems approach towards understanding the mechanistic cellular response to extracellular biomaterial geometries. "… destined to become a standard handbook for bioprocess engineers. It provides a detailed discussion of emerging areas, such as disposable bioreactors, that are scarcely covered in the books that are currently available."